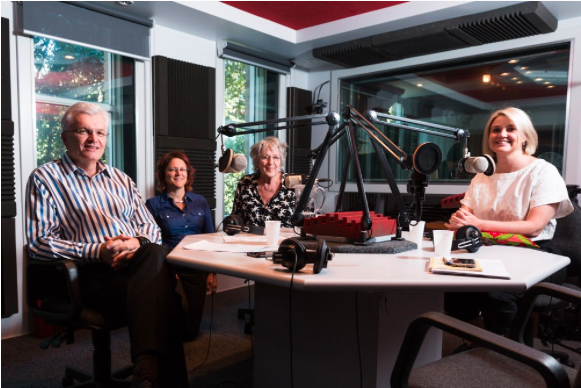 Left to right: Vice-Chancellor Glyn Davis, Joanna Fletcher, Germaine Greer and Mary Polis. Credit: Drew Echberg. The nuclear family is “unhealthy” and our traditional societal structures enable family violence, according to Germaine Greer in the latest episode of the University of Melbourne’s The Policy Shop podcast. The episode is hosted by University of Melbourne Vice-Chancellor Glyn Davis. It also features the former Chief Executive Officer of Victoria’s Royal Commission into Family Violence, Mary Polis, and Women's Legal Service Victoria Chief Executive Officer Joanna Fletcher and explores the causes of, and possible solutions to, family violence. The panel agreed that family violence is a universal problem, which has been hidden within the domestic space for too long, with Greer arguing against the nuclear family altogether. “It's too small, and you've got too much confrontation. You've got one generation against another generation, you've got man against woman, you've got child against parent. They're in a perpetual state of conflict,” she said. Potential solutions were discussed, ranging from working with boys to support attitudinal change, to new ways of managing the family court system. One proposal from Ms Polis is that restorative justice is used in family violence cases – a model commonly used in youth offending. “Women who have gone through the court system very rarely get the outcomes that are right for them. I think we owe it to the victims of violence to have somebody understand the impact on them, and for some form of accountability that's meaningful to be put in place,” she said. Dr Greer was in Melbourne to meet the archivists who have been cataloguing and processing the Greer Archive, a world class collection here at the University of Melbourne.